100% dead sea salt with frankincense, orange and skin-softening botanical oils - nothing else added, it has a unique formula that works as a skin polishing body scrub and a luxurious bath soak. Made from 100% pure dead sea salt and skin-softening botanical oils, naturally leaves skin incredibly smoothed, nourished and revitalised. With fragrant frankincense and orange to calm the mind and help promote a restful night’s sleep, the unique and multitasking formula doubles as both a luxurious bath soak and an effective skin polishing body scrub. Naturally micro bead free, helping to both promote healthier skin and protect the world’s oceans. With a relaxing, gentle fragrance. Pure, high quality, natural mineral salts and botanical oils - nothing else added. Massage onto damp skin then rinse off for silky smooth skin. Avoid contact with eyes. If contact occurs rinse well with water. If it persists seek medical attention. Seek advice if suffering from a medical condition. 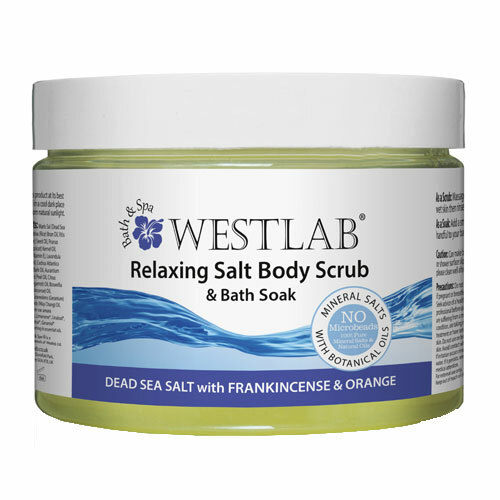 Below are reviews of Westlab Dead Sea Salt Body Scrub - Relax - 500g by bodykind customers. If you have tried this product we'd love to hear what you think so please leave a review. First class body scrub. I was impressed. On the label it says that you have to be careful because it's a little oily keep that in mind. This product is amazing! As a runner I am prone to tired legs and achy muscles and by using these salts my legs are fantastic the next day. I use in the shower with an exfoliating shower glove to really massage into my muscles. Or I use one to two handfuls in the bath for relaxing especially after a long run. Your skin is left soft and smelling great! I have recommended these salts to friends who also find amazing. Lovely smell. A bit awkward to use, but leaves the skin beautifully moisturised.